I have a dream. That dream is to be able to go through an entire day (or few days) with just ONE wireless device. I'm tired of being tethered to cable, a phone, a laptop, a PC, etc.. I've been having some trouble with my mobile phone connection at my residence, so I decided to return to using Skype after a long absence. I think Skype may get me closer to reaching my dream. Skype, for those who don't know is voice-over-internet-protocol (VOIP), which is essentially the ability to use the phone over the web. All you need is a free download, and a headset with audio and a microphone. It is now possible to sync Skype with all of your phone numbers, so theoretically, you could use your laptop or smartphone or notebook as your only phone. It's also an instant-messaging service and will accept contact imports from Facebook, most e-mail services, and several other contacts services. 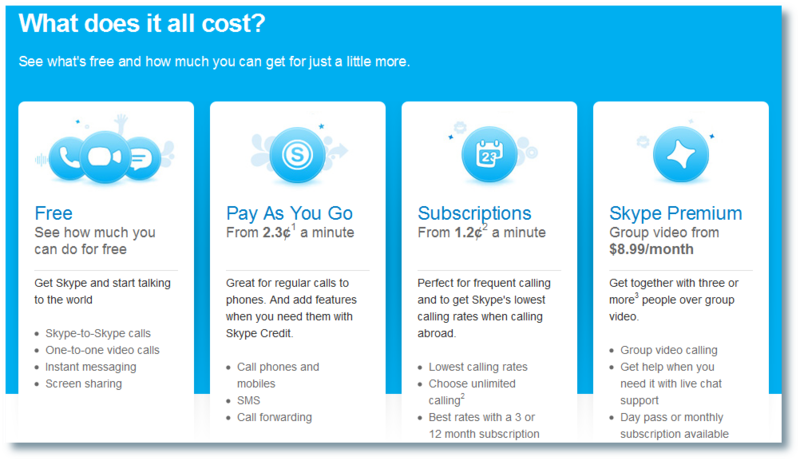 Although Skype's rates have increased somewhat since the last time I used it, there are several different plans that keep it affordable depending on your needs. Skype-to-Skpe calls are always free. Occasional users will want to use the pay-as-you-go option shown above. If you plan to use Skype frequently, and most of your calls are to one country (including if most of your calls are within the U.S. and Canada), you'll want to sign up for the monthly subscription service to that country, which can bring the cost per minute down to a fraction of a penny. Try it out by visiting Skype.com.